Home » What's Up with the State Fiscal Crisis? What's Up with the State Fiscal Crisis? The CT Mirror ran a detailed five-part series, A Legacy of Debt, to explain the crisis. Keith M. Phaneuf has been doing excellent reporting on the issue, @CTMirrorKeith in case you want to follow him on Twitter. Fairfield County Community Foundation’s most recent 25on25 webinar series, Connecticut’s Economic Uncertainty & the Future Philanthropic Landscape, featured Keith Phaneuf. Comparison of Budget Proposals: from Governor Malloy, Senate Republicans, House Republicans, Senate Democrats and House Democrats for the line items that are of most interest to nonprofits. Following the document can be confusing as some of the proposals consolidate or move line items. If you have any questions, contact Jeff Shaw, Director of Public Policy, The Alliance. Nonprofit Survey Results (6/14/17): Impacts of reduced or delayed payments from the state. The State of Working Connecticut 2016 traces major trends in Connecticut’s economy over the last 15 years, demonstrating widening racial disparities and a shift towards low-wage work. This has implications for the state budget since, in times of increased inequality, increased resources are needed more than ever—but a shrinking share of high-wage jobs makes raising that revenue more difficult. American Community Survey 2015 highlights Connecticut’s stubbornly high poverty and child poverty rates along with some of our strengths, including high household incomes and low uninsured rates. A Better Approach to the State Budget details policymakers’ cuts-heavy proposals to address the fiscal crisis, underscoring the consequences these cuts will have for children and families. 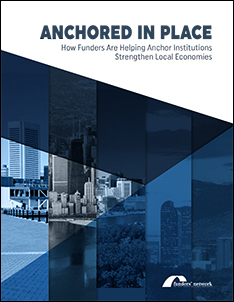 Anchored in Place: How Funders Are Helping Anchor Institutions Strengthen Local Economies, a new report issued by the Funders’ Network as part of their Anchors Institution Funders’ Group, examines the potential these deeply rooted local enterprises hold to create lasting and sustainable change—and illustrates how funders are working with anchor institutions to create healthier, more equitable, and economically vibrant places to live and work. 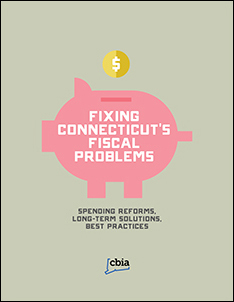 Connecticut Business & Industry Associatio (CBIA) report, Fixing Connecticut's Fiscal Problems: Spending Reforms, Long-term Solutions, Best Practices, describes Connecticut's spending problem, explains we got there, and provides solutions and best practices for solving this big problem. Center on Budget and Policy Priorities recent report, How States Should Respond to Recent Federal Tax Changes? provides rich details on the options available to state lawmakers to protect state revenue. Find news on the effects of budget cuts on nonprofits, nonprofits reeductions and closures, funders responses and more.